This is an edited book with contributions from well-known 38 leading authors which discusses existing and emerging nanotechnologies in key sectors such as medicine, advanced materials, energy, and electronics with applications of nanotechnology in these areas. 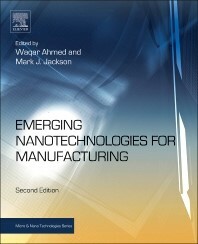 In this second edition of the book, the chapters have been updated and expanded to cover emerging Nanotechnologies and latest developments in nanotechnologies for manufacturing and to cover new developments such as nanosupension and nanocarriers in the medical fields, with applications in drug delivery systems. New chapters on graphene and smart precursors for novel nanomaterials are also included in this edition. This book can serve as an excellent guide to R&D scientists and engineers and entrepreneurs besides benefiting engineers, scientists and technical managers working in manufacturing sectors particularly in medicine, electronics, advanced materials, energy, and agriculture areas.